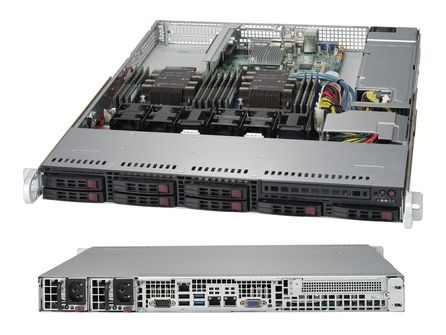 The Supermicro 1029P-WTR SuperServer is a 1U Rackmount server with 10 Hot-swap 2.5" SAS/SATA HDD bays, 2x 10GBase-T LAN ports via Intel® X722 and 750W Redundant Power Supplies. 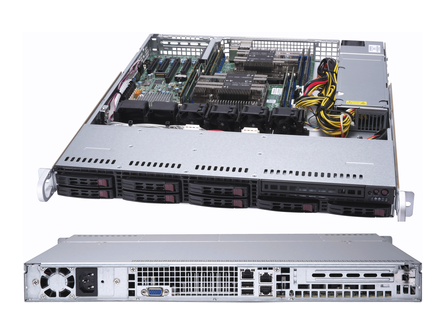 The Supermicro 1029P-WT SuperServer is a 1U Rackmount server with 8 Hot-swap 2.5" SAS/SATA drive bays, 2 1GbE LAN ports via Intel® X722 and 600W Multi Output Power Supply. The Supermicro 6019P-WT8 SuperServer is a 1U Rackmount server with 8x 3.5" and 2x 2.5" Fixed drive bays, 2 GbE LAN ports via Intel C621 and 600/650W Multi-output Power Supply. The Supermicro 6019P-WTR SuperServer is a 1U Rackmount server with 4 Hot-swap 3.5" SAS3/SATA3 drive bays, 2 1GbE LAN ports via Intel X722 and 750W Redundant Power Supplies. The Supermicro 6019P-WT SuperServer is a 1U Rackmount server with 4 Hot-swap 3.5" SAS3/SATA3 drive bays with SES2, 2 1GbE LAN ports via Intel X722 and 600W Multi Output Power Supply. 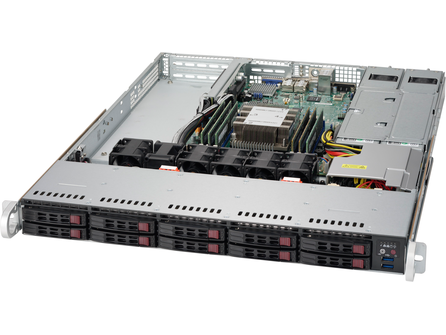 The Supermicro 6019P-MT SuperServer is a 1U Rackmount server with 4 Hot-swap 3.5" SATA3 drive bays, 2 GbE LAN ports via Marvell and 500W High-Efficiency Power Supply. The Supermicro 1029P-MT SuperServer is a 1U Rackmount server with 8 Hot-swap 2.5" SATA3 drive bays, 2 1GbE LAN ports via Marvell 88E1512 and 600W High-Efficiency Power Supply. The Supermicro 6019P-MTR SuperServer is a 1U Rackmount server with 4 Hot-swap 3.5" SATA3 drive bays, 2 GbE LAN ports via Marvell 88E1512 and 600W Redundant Power Supplies. The Supermicro 6019P-ACR12L SuperServer is a 1U Rackmount server with 12 Hot-swap 3.5" SAS3/SATA3 drive bays, 2 10GBase-T ports via Intel C622 and 600W Redundant Power Supplies. The Supermicro 1029P-NER32L SuperServer is a 1U Rackmount server with 32 Hot-swap PCI-E EDSFF-S drive slots, 2x 10GBase-T LAN ports via Intel X550 and 1600W Redundant Power Supplies. 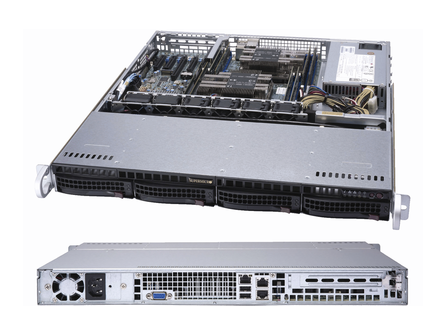 The Supermicro 1029P-WTRT SuperServer is a 1U Rackmount server with 10 Hot-swap 2.5" SAS/SATA HDD bays, 2x 10GBase-T LAN ports via Intel® X722 and 750W Redundant Power Supplies.